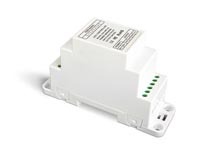 This DIN rail LED power repeater has three outputs of 5 A and is easy to install on a DIN rail. The output signal is PWM constant voltage. power consumption: 360 W max.